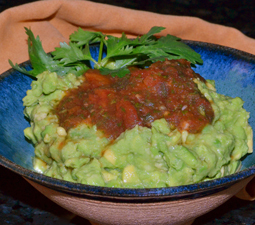 Mrs. A's Guacamole - A recipe from Savor California, the online showcase for extraordinary gourmet foods and beverages from California. Mash the avocados with the salt, pepper, and lime juice. Add the jalapeño, cilantro, tomato, and salsa.